The Sharp's 70 In. Interactive AQUOS Digital Signage Display Board has a 10 point multi-touch/multi-user system that allows up to four people to write on the screen at the same time using touch pens or fingers. This newly designed touch screen has raised the bar and it is superior in every aspect to the last generation. The highly responsive touch pens allow several people to write on the same screen at the same time. With full 1920 x 1080 (1080p) resolution from analog RGB, digital RGB and HDTV video sources. 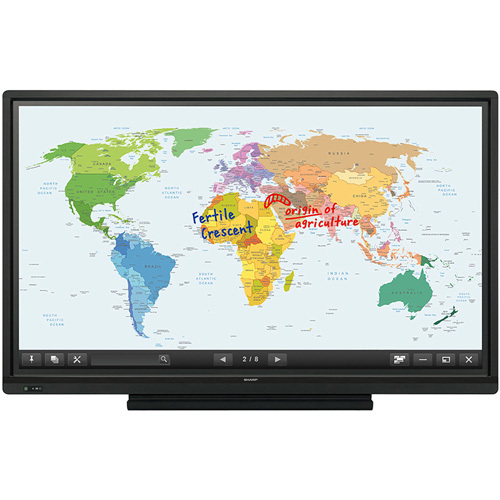 The Touch Display Link 2.0 Software Onscreen allows content, including handwritten notes and drawings made in real time, to be viewed simultaneously on the AQUOS BOARD and mobile devices such as PCs, tablets and smartphones.